This baby boy has the coolest parents ever. 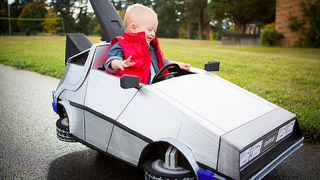 For his first Halloween, his awesome parents dressed him up as Marty McFly from Back to the Future and built him a DeLorean push car. Just look at him inside his tiny little DeLorean, it's one of the most adorable Halloween costumes ever. It all started with a red puffy vest Cooper already had and a side comment from my husband about Marty McFly in late September. I've always loved Back to the Future, and love cars since I was little and grew up going to car shows with my Dad; what better way to tote my 1yr old son around on Halloween than in a transformed $25 Step2 push car I bought off of the kidsale alias at work? So, I spent a few weekends and nights in October recreating the iconic DeLorean with cardboard, tape, paint, and a little help with some EL lighting from my husband, Jeremy. The perfect costume for Cooper's first Halloween! Cooper looks so happy inside his DeLorean. I hope he gets the most candy in the history of Halloween because this costume totally deserves it.